1 The new workshop manual, which irritatingly does not have a publication date but has 28 service sheets and 48 pages, mentions the use of shims on the prop shaft between the crown wheel thrust washer and the end of the front end cap bush (1377) - then does not explain how they are used ie whether one tries to take up all the slack, to a snug fit, or whether one leaves some play. Even without, there is only about 1 mm play, but common sense(!) tells me there should not really be any....what would normal workshop practice be? 2 the brass collar inside propellor(1410A) has a hole for the pin (1412) that is eccentric - see photo. Is this intentional so that one can fit it one way to increase the pressure on the rubber oil seal, and the other to decrease it? 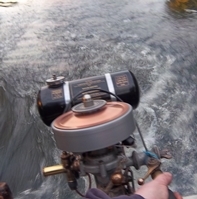 Going off on another topic, can anyone tell me what the thread is on a Bing carburettor float bowl...is it possible/advisable to V coil it? I personally fit shims to reduce end float to a minimum, but l still like to leave a small amount of play, perhaps 005” at the most. What you don’t want is the shaft lolloping about in the box. Last edited by Oyster 49 on Thu Sep 20, 2018 11:50 am, edited 1 time in total. Brilliant that's what I suspected - any tips on a supplier of imperial washer shims, and if I ask for 1/2 inch id and 1 inch od like the thrust washer will it actually be a clearance fit i.e. 0.5 mm larger on the id? I am never sure what the original build spec was in respect of gearbox backlash. The shims seem to go up in size in steps (from memory) of about 0.015, so I suspect that the variation was in that kind of order. I am sure that you are right Adrian that .005 is a good figure in theory. But a larger value of .010 to .025 is easier to obtain and just in case the measurement goes astray or later on the gasket is left off, I think this larger value is possibly safer. That is just my opinion. We are talking about measuring it by the axial float on the propshaft? This is difficult to measure without a dial indicator gauge. Seagull hardened steel thrust washers come in 3 thicknesses 12 (0.104"), 13 (0.092") & 14 gauge (0.080"). And are used both between the pinion bearing & the pinion gear, & the crown wheel & the bearing in the end cap, in varying combinations to give a suitable gear meshing clearance. Both of these thrust washers wear, as do the teeth on the crown wheel & pinion gears. John & British Seagull both carry stocks of these washers. I don't recall ever seeing any propshaft end float figures in any of the Seagull technical info I have, & have always used feel under load, when everything has a good oil cover as a good end result. Remember your propshaft thrust washer will be operating under a load of between 40 to 130 pounds depending on your model of Seagull! I normally aim at 10 to 15 thou, I make and harden my own thrust washers from silver steel.